The author (Dr Oto Makýš from Department of Building Technology, Faculty of Civil Engineering, Slovak University of Technology, Bratislava, Slovakia) discusses the importance of including maintenance costs while planning an experimental construction based on the example of Lip­tov­­­­ská Mara. Some of the recent experimental constructions seem to concentrate only on research, plan and execution of the building. The question of further maintenance has been neglected. The entry information can only par­tially be specified. Often most of the above mentioned key information is missing. Use of analogous solutions based on other finds, often from large areas or parts of Europe does not necessarily supply sufficient information. It must also be pointed out that use of analogous solutions from later folk buildings might be misleading. Construction details and woodworking technology have developed – most preserved wooden cabins were built at the end of the 19th and beginning of the 20th centuries. Therefore experiments are primarily looking for possible solutions and testing them. a) The composition and especially the proportion of tree species were different in the past. This also concerns the quality of wood mass used, which is generally higher than it is today. The environmental pollution today is substantially higher. In Slovak biotopes some of the species have been suppressed (for example yew tree), some others without natural enemies have been introduced (for example acacia) and also there have appeared new pests towards which Slovak biotopes are not resistant (for example the Domestic Dry Rot Fungus Serpula lacrymans) (Reinprech-Žák, 1998). b) Modern methods solve the problems of maintenance of wooden buildings with the use of fundamentally different building materials (concrete, steel, plastic) which are unauthentic solutions, unsuitable for experimental constructions and besides which are not absolutely effective. Therefore it is necessary to determine what way the future existence of the constructions can be maintained before the start of the building. It is clear that if the construction should not disappear within few years regular upkeep is necessary. c) The problems might be solved by, for example, the use of acacia for posts placed in ground, bandaging of the underground part of a post with bandages soaked with chemical preservatives, pressure treatment of the underground parts, consistent placing of bottom beams on corner stones of sufficient height, digging circumferential channels, possibly even hidden drainage around the building to take rain water away quickly, placing of drainage above the buildings or to divert underground water and so on. Also for example covering straw or reed roofs with thin nets protecting them against damage from birds and wind, regular airing of the building including the securing of necessary airing throughout the whole year. 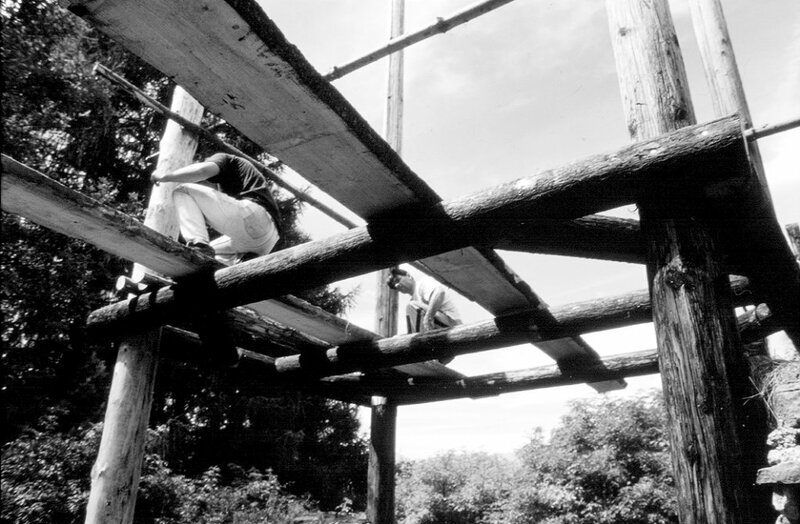 d) The placing of wooden beams into constructions – that means the construction details used – should be done in a way to prevent water pene­tration into the structure, to allow it respectively to run off and dry the organic material as fast as possible (see placing of box-frames on corner stones). Even then it is not always possible to prevent the wooden structures from getting wet, especially the posts. Ways to repair wooden buildings with exchange of single damaged parts for new ones, without dismantling the whole construction, have existed probably as long as wooden structures and were part of the constructors’ know-how. e) Regular maintenance (at least once a year – in the spring) means the clearing away off grass, self-seeded trees and the lowering soil deposits along the wooden constructions. It is not necessary to heat the buildings because the drying effect is usually not proportional to the effort and expenses with the exception of one time drying of very damp constructions. Otherwise regular airing is sufficient. During maintenance it is also necessary to pay attention to the condition of the roof and immediately repair any damage which would allow water penetration. It is also useful to check the building during strong or long lasting rains which reliably show any openings. f) Under condition where the humidity level in the construction does not cross 10%, or respectively 20% limits for more than 3 months, the structure has a chance of a long lifetime. Use of chemical preservatives is debatable because their effect is on one hand time limited (it is necessary to renew it after certain time) and on the other technologically dependant (the most effective method is pressure impregnation). At the same time their use is not suitable in spaces with a long term presence of people or animals (‘living’ open-air museums). On the other hand their use for posts placed into ground is practically unavoidable. g) If a fungi infection is discovered the action depends on its origin. If the infection came with the building wood then the infected part (and often also the adjacent parts) should have to be immediately and carefully removed and burnt at a safe distance to stop the infection spreading. If the infection is caused by neglect which results in a rise of the relative level of wood humidity (for example insufficient airing, rise of the soil level up to the wooden structure and so on) it is possible to try (with airing, removing the soil and so on) to transform the acute infection into a latent state, when the infection does not develop any more (or minimally) and the infected structure can survive without the replacing of parts for some time. h) In any case it is necessary to take into account that after some time it would be necessary to replace some elements of the building. The organic roof cover if it is not continuously preserved by smoke, has to be replaced under normal conditions every 10 to 20 years, damp wooden beams in less than 10 to 15 years, earth fast posts (depending on the preservative use) in about 10 to 15 years. i) These ways of operating and maintaining a building close to the original is demanding on time, expenses and ­human power. Dependence on volunteers is not a solution, as it is possible to say from experience that volunteer groups are mercurial (usually they endure the upkeep of a structure for about 3-5 years). Therefore the best solution is the founding of a professional service which looks after the operation and upkeep of the structure or site or at least to affiliate the building to an already existing professional body (museum, local council) which then has to guarantee the regular appropriating of both human power and money necessary for the maintenance. j) Construction experiments are often done by enthusiasts. Either specialists, archaeologists, historians without technical education or volunteers (usually students) with various backgrounds. The advantages are low cost and enthusiasm together with a willingness to look for the most suitable construction and technological solutions during the work without which the experiment probably cannot be carried out. The disadvantages are the long time of execution and the need to devote time to work with volunteers. The use of professional craftsmen eliminates these disadvantages. On the other hand it brings the danger of using modern solutions of construction details and techniques and usually much higher costs. The archaeological site on the Havránok hill (Liptovská Mara – site 1) belongs among the most important sites of the Púchovská culture (late La Tène – early Roman Empire Period, the 2nd century BC – the 1st century AD) (Pieta 1996) not only in Slovakia but in Central Europe. The excavations have been taking place since 1965 under the leadership of PhDr Karol Pieta, DrSc (Archaeological Institute of the Slovak Academy of Science). 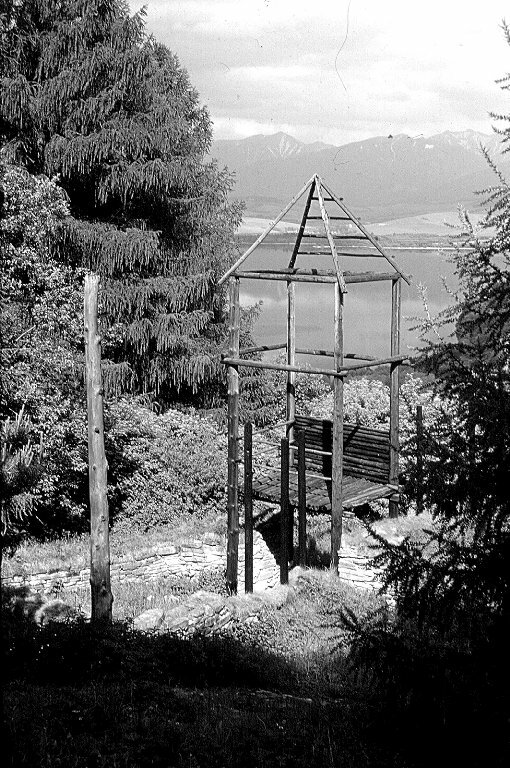 From 1986 to 1992 the first stage of the project of gradual mock-up and experimental construction of chosen elements in the area took place with the aim of introducing visitors to the 3-D depiction of the mentioned era, within the landscape and on its original site. Up to now there have been constructed, using different methods: a farmstead with the residential building and several outbuildings, fragments of the defensive wall of the sacrificial area on the Eastern terrace with a gate tower, a gate to the upper hill fort together with fragments of walls, a wooden grubenhaus and finally a medieval fort on the top of the hill. All constructions fell under the control of the Liptovské Museum which founded the first archaeological open-air museum in Slovakia. During the earlier years of the running of the open-air museum the property manager (former management of the Liptovské Museum) did not respect its value and there was insufficient continuous maintenance of the site. Some structures were occasionally repaired, rebuilt or added to but practically always on the initiative of the Archaeological Institute SAV and were limited by time and possibilities (Pieta 2002). This resulted in extensive damage to the area, especially to the wooden structures which are most exposed to the weather. Gradually they had developed fungi infections, including infection with the Domestic Dry Rot Fungus (Serpula lacrymans). 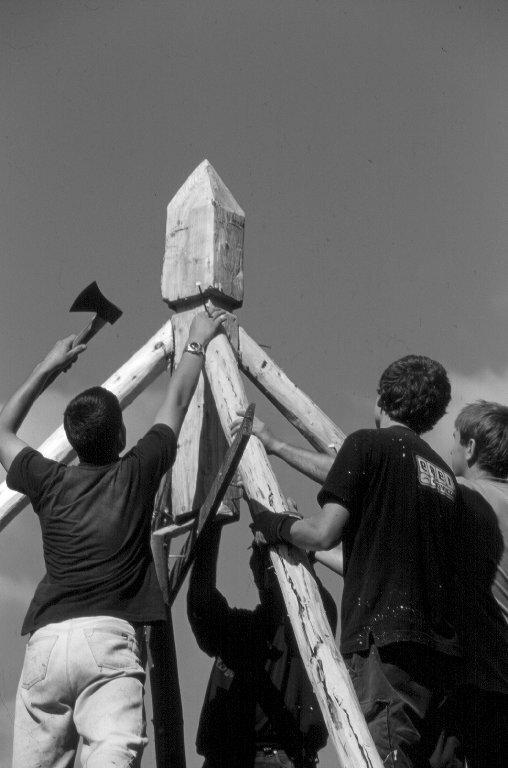 In 2003 the museum management has changed and at the same time they succeeded in securing a grant in co-operation with the Archaeological Institute SAV, Faculty of Civil Engineering and Faculty of Architecture both of the Slovak University of Technology and the Institute of Monument Protection. The subject of the grant project ‘Ochrana a záchrana historických pamiatok na Slovensku ako integrálna súčasť európskeho kultúrneho dedičstva (koncepcia a realizácia)‘ / Protection and preser­vation of historical monuments in Slovakia as an integral part of European cultural heritage (concept and execution) became the stabilisation of the entrance area (gate tower and adjacent wall – entrance to the sacrificial area) to the hill fort Liptovská Mara – site 1 – Havránok – the Eastern terrace. The preparation started with an examination of the grounds. On the basis of its conclusions and hypotheses the stabilisation project for the first structure (gate tower) was prepared. The original structure of the gate tower to the hill fort (sacrificial area) from the east has not been preserved. The archaeological research (Pieta 1996) uncovered a wall built from large flat blocks of sandstone, quarried probably on site in the form of large slabs, 5-15 cm thick. The building blocks were overlapping (the original builders knew the basics of developed wall building) connected only with clay (maybe clay mortar). At the gate area the wall was interrupted and the surface was cobbled with middle size pebbles. The presumed gate tower was preserved only in plan with four post-holes in the corners of an irregular trapezoid. The post-holes were originally about 60-90 cm deep. The placing of posts corresponds with recesses in the preserved adjacent walls on both sides. Based on the depth of the post-holes it was presumed that the structure was a tower-like building, maybe up to three floors high. During the already mentioned first stage of construction a tower-like structure was built on the site of the original entrance. As there was not enough information on its design it was built as a mock-up (Pieta 1996). To preserve the natural character of the area, and recapturing the original design of the buildings it was decided to respect the original building material – wood. The shape of the structure was suggested only with the lines of the load-bearing posts and beams at the height of the presumed floors. On the second floor there was constructed a floor and part of a wall up to 1.5 m high. The presumed pyramidal roof was suggested only with corner beams. As material they used old electric posts of unknown age which were originally machine shaped and pressure impregnated with an unknown chemical preservative. The exception was one of the posts which was made from freshly cut pine tree without chemical treatment. The floor, wall and roof line were made from commonly available timber, also without any special treatment. Because it was only a mock-up no special attention was paid to the construction details and the joints were made with common nails of adequate sizes. In the places where rungs were attached recesses 5-7 cm deep were cut, about 20 to 50 cm from each other. 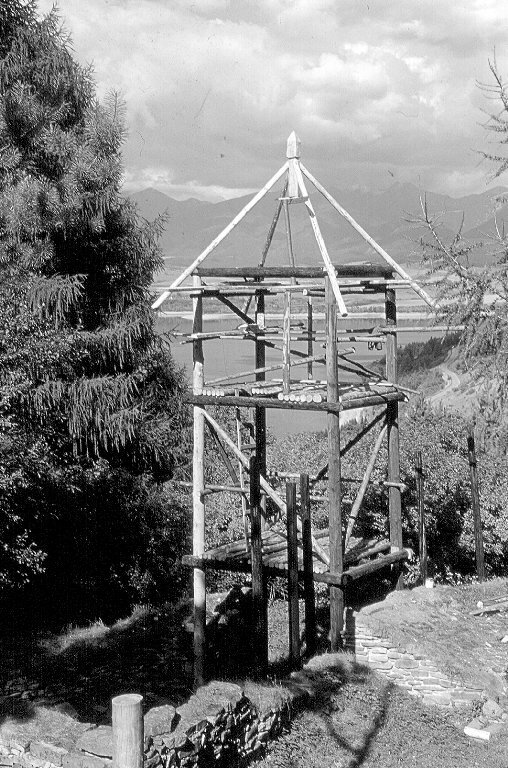 The lack of maintenance showed on the tower construction with the decay of the pine post in the contact zone of ground-air and its general weakening (during reconstruction it was possible to break it with the pressure of one hand). Part of the rungs was destroyed and rot had developed in most of the joints caused by the collecting of rain water. The centres of the tops of the electric posts were also damaged – to about 0.3-0.5 m depth. 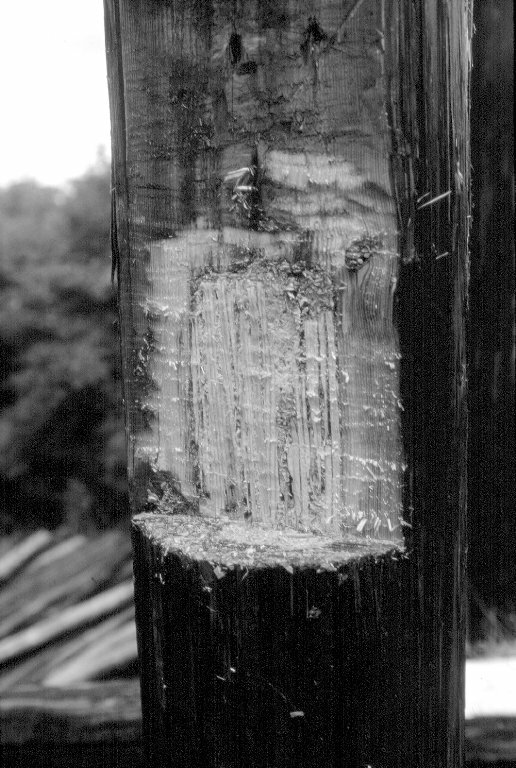 The posts were cracked – some of the cracks reached nearly 2/5 of the diameter and were up to 1 m long. 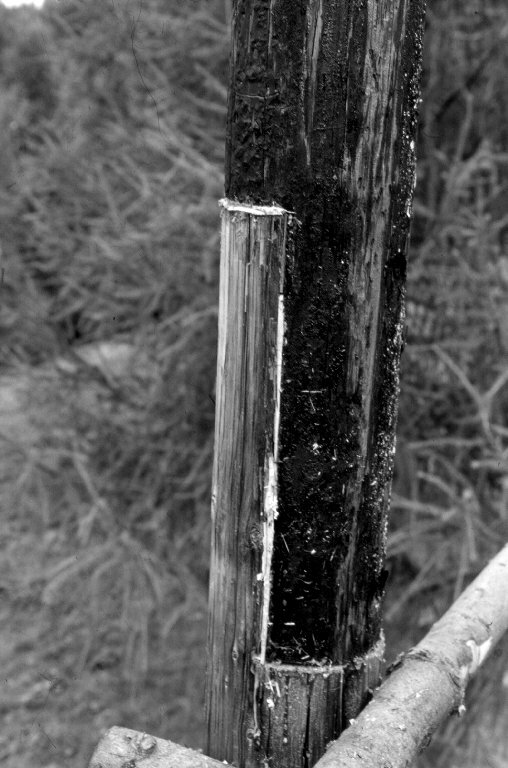 Two posts were damaged by woodpeckers – several rounded holes about 5-4 by 10-12 cm in size and about 5-7 cm deep. After assessing the situation on the basis of the examination of the grounds the damage of the tower building was rated as in a state of disrepair (Znalecký štandart 1993) with rapid stabilisation necessary. Therefore it was decided to carry out a general reconstruction of the tower structure. Because of the condition of the tower it was necessary to dismantle the entire structures and joints with the exception of three of the load-bearing (originally industrially treated) posts which we decided to leave in their original positions. Thanks to the scale of the work we have decided to reassess the original building design. The project was therefore determined by two main view points – methodological and technical. The methodological point of view concerned presentation. The experience with the open-air museum confirmed that the original idea that a 3-D presentation of chosen structures would substantially increase the value of the area even with a regard to the uncertainty of the original design (it has not been possible to recover it). The wooden construction of the tower has fulfilled its function as its (although only suggestive) shape enlivens the whole of the sacrificial area and gives visitors the chance to imagine its design in its given era. Conclusion 1: The gate tower will be presented in 3-D form in the form of a wooden construction. The technical point of view concerned mostly the use and maintenance of the structure. Several years of experience has shown that to secure a continuous, uninterrupted and thorough maintenance of an uncovered wooden free standing skeleton structure exposed to the weather is impossible for many reasons (financial, organisational, technical, human power etc). Without maintenance the lifespan of a substantial reconstruction would be again only several (7-10) years. To organize an expensive reconstruction bordering on a complete rebuild within such short intervals was assessed as being impossible. The solution had to be a type of construction which would slow down the decay of the wooden material of the building. Conclusion 2: The gate tower will be constructed with roof and a circumferential cover. A combination of both points of view brought many important questions which were answered with following hypotheses. Problem 1: What shape and size should the tower be? Solution: The tower, despite the above case, will continue to be a mock-up presentation as the information about its design is minimal. In future it will not be presented only as the outline of a building but as a complete model of a possible tower construction above the gate. The plan of the tower is given. It will be expanded only by the attaching of a cover. The current elevation of the building will be preserved. Vertically the tower will be again divided into three floors. The first floor will present the gateway, the second a walk through floor on the level of the wall walk with an added defence function and the third guards and defensive position. The second floor will be passable transversally (following the line of the walls), the third one will only be accessible by stairs. 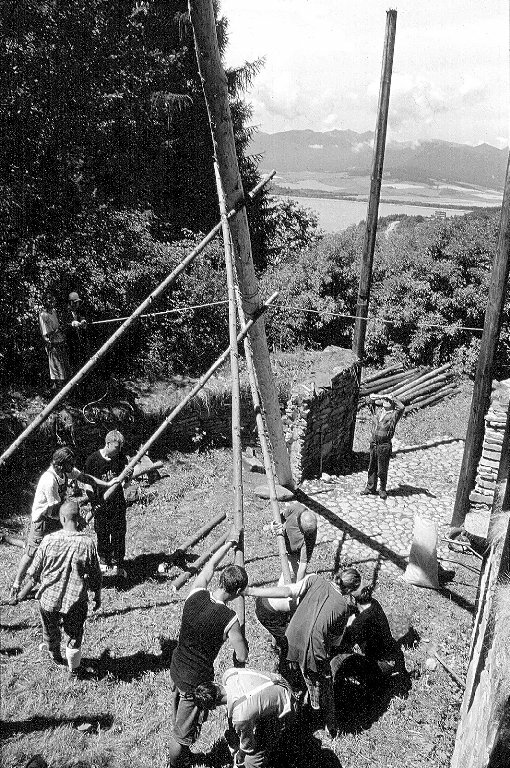 The height of the floors while respecting technical restrictions (making use of recesses ready in the posts, originally made for the attachment of rungs) will be close to the current typological agreement on ancient wooden fortifications in Europe. This means that the height of the gateway will be about 3.5 m (height of a rider with a spear pointing upwards), the second floor about 3 m (standing warrior with a spear) and the third floor (including the open roof space) again about 3 m.
Problem 2: In what way should the construction details, especially the joints be made? Solution: Because of the chosen method of a mock-up the construction details and joints will not be a reconstruction of an ancient building but openly admit to modern technology. The details will be therefore in the first place as resistant as possible to weathering and vandals. It was decided to use nails with possible minor adjustment of timber to improve the strength of the joint (flattening of surfaces) and to avoid any complex carpentry joints. The rotting tops of the posts (centres) will be (according to the scale of damage but at least in the length of 0.5 m) cut of and replaced with new parts from impregnated wooden posts. They will be joined by overlapping (to at least 0.5 m length) while the cut surfaces will be at right angles on both sides. The joint will be strengthened with adhesive (Duvi­lax) and nails (at least 2300 mm nails, hammered towards each other at angle of at least 30°). Problem 3: In what way will be the protection of the building secured? Secures as fast drying as possible of leaked or blown in water. The main load-bearing construction (rough structure from vertical and horizontal elements) will be built from industrially impregnated old electric posts, which show elsewhere at the grounds (in the same conditions) a very good state of preservation. The casing (roof, walls) and floor will be done in such a way as to allow the dismantling and replacement of them in future without the necessity to dismantle the main tower structure. At the same time they will be made from cheaper wooden material (planks, split logs) so that the cost of their renewal is as low as possible. The parts exposed to weather (especially the roof) will be treated with chemical preservatives. The posts will be placed in ground using concrete (this method has been shown in other parts of the area to increase the lifespan of the wooden posts) with stone collars at surface level to blend in with the surrounding cobbling. The structure will be strengthened at every vertical and horizontal plane with triangle and cross ties. The joints will be secured with nails. Further there will be used cement, quarried sand, water, exterior adhe­­sive Duvilax and steel nails 150 – 300 mm long. Two specialised supervisors, one qualified building manger, two trained technicians or craftsmen, 2-4 trained assistants, 10-15 workers for preparation and transport of the building material. The reconstruction can be carried out only from spring to autumn (approximately April – October). Because of the untested nature of the work and the participation of University students it is not possible to determine an obligatory time-table but it will be necessary to organize the work accordingly to the situation on the building site. According to the scale and character of the work it is possible to estimate it will be finished within two seasons. On the basis of these hypotheses and conclusions the project of the tower reconstruction was prepared and the work started in the summer of 2003. The work was carried out by the technicians from the Archaeological Institute and students from the Faculty of Civil Engineering and other Slovak and Czech Universities together with the civic association Strom života. Building material was provided by Liptovské Museum. Supervision was provided by the author and PhDr Karol Pieta DrSc. Static scheme was consulted by ing Vladimír Kohút. 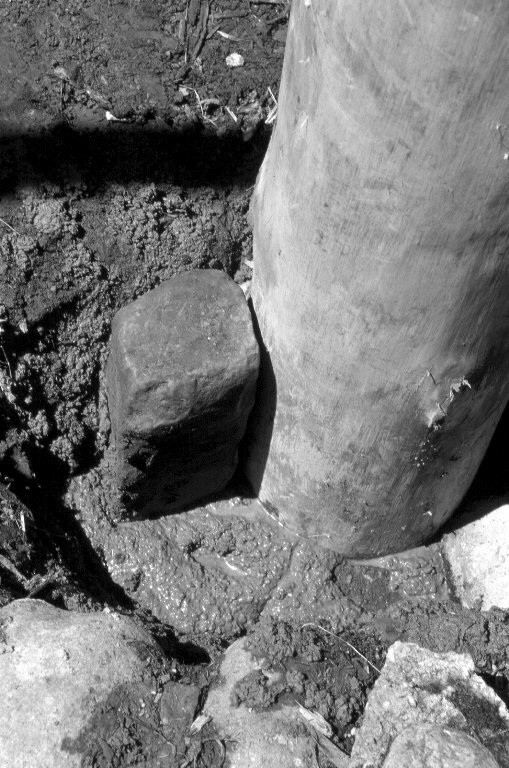 b) The original setting in concrete of the other three main posts proved to be in a very good condition and the condition of wood in the contact zone ground-air was, despite long term use, satisfactory – therefore the fourth post was also set in concrete. c) The setting of the new post into the original hole had to be reversible – therefore blocks of sandstone were embedded into the concrete. If necessary it will be possible to break these and pick the concrete out in pieces. d) In two of the original posts (chemically treated!) woodpeckers made several deep holes which weakened locally their load-bearing capacity – the post were therefore reinforced with lamellas. During the summer and autumn of 2003 and the spring of 2004 we have managed to carry out most of the building connected with the reconstruction of the gate tower on the Eastern terrace of Liptovská Mara 1. Some work remained (because of problems with obtaining wood) for the summer of 2004. After assessing the first stage of the project we are preparing the completion of the space around the gate with the constructing of adjoining parts of the original defensive wall. The lower part of the wall was built in stone. During the original project at the beginning of the 1990s it had not been completed up to the uncovered height. The upper part of the wall was a wooden superstructure partly supported by posts. A substantial problem seems to be the active slope movement which permanently endangers the Eastern terrace of the hill fort which will have to be stabilised. As slope movement is common in the Carpathians and endangers also other monuments it will have to be treated in an effective and cheap way. The reconstruction project utilises designs prepared by ing arch Jozef Salus provided by employees of the Archaeological Institute SAV in Nitra PhDr Karol Pieta DrSc and Štefan Hric. The designs were prepared in 1992 on the request from the building provider – Liptovské Museum in Ružomberok and Archaeological Institute SAV in Nitra. Viele der gegenwärtig errichteten experimentalarchäologischen Konstruktionen scheinen ihren thematischen Schwerpunkt im Bereich von Forschung, Planung und Aufbau des jeweiligen Gebäudes zu setzen. Dagegen kann beinahe jede Konstruktion – abgesehen vom Wert für die Forschung - eine bedeutende darstellende Funktion haben. Dies bedeutet, dass die zukünftige Existenz der Bauten zu gewährleisten ist. Es ist deshalb notwendig, das Problem der Instandhaltung bei der Planung eines Experiments zu berücksichtigen. Der archäologische Fundplatz auf der Anhöhe von Havránok (Liptovská Mara – I) gehört zu den bedeutendsten Fundstellen in der Slowakei. Ein Projekt, bei dem in verschiedenen Abstufungen Modellbauten in Originalgröße und experimentalarchäologische Konstruktionen von ausgewählten Elementen des Gebiets errichtet wurden, konnte zwischen 1986 und 1992 durchgeführt werden - vor allem mit dem Ziel, die Besucher mit 3-D-Darstellungen vertraut zu machen. Mit unterschiedlichen Methoden wurden dabei folgende Objekte erbaut: Ein bäuerliches Gehöft mit Wohnhaus und diversen Außenanlagen, Teile des Verteidigungswalls mit einem Torturm, ein Tor zur oberen Höhenburg mit Abschnitten des zugehörigen Walls, ein aus Holz erbautes Grubenhaus und eine mittelalterliche Befestigung auf der Kuppe der Anhöhe. Der Torturm wurde als Modell in Originalgröße errichtet, da keine ausreichenden Informationen über sein Aussehen vorhanden waren. Die vermutliche Form der Anlage konnte lediglich auf Grundlage der Pfostenreihen der tragenden Pfosten und der Balken in der Höhe der vermuteten Geschosse ermittelt werden. Das Obergeschoss wurde dabei als Geschossboden und als Teil des Walls in einer Höhe von bis zu 1,5 m aufgeführt. Das pyramidenförmige Dach war lediglich auf Grundlage der Eckbalken zu vermuten. Während der ersten Jahre waren die Instandhaltungsarbeiten für die Anlage nicht ausreichend, so dass es zu einem langsamen Verfall kam. Die fachliche Bewertung der Situation im Jahre 2003 erbrachte die Einschätzung, dass der Turmbau eine sofortige Stabilisierung benötigte. Daraufhin wurde entschieden, dass der Turm vollständig rekonstruiert werden sollte. Die Erfahrungen bestätigten, dass die ursprüngliche Idee, eine 3-D-Darstellung ausgewählter Befunde würde den Wert des Geländes wesentlich steigern, korrekt gewesen ist. Mehrere Jahre an praktischen Kenntnissen haben darüber hinaus gezeigt, dass eine kontinuierliche, ununterbrochene und gründliche Instandhaltung einer ungeschützten, freistehenden, “skelettartigen” Struktur aus Holz, die dem Wetter dauerhaft ausgesetzt ist, aus verschiedenen Gründen (z. B. finanzieller, organisatorischer und technischer Art) nicht möglich ist. Ein Schutz muss vor allem durch ein entsprechendes äußeres Gehäuse und durch eine entsprechende Bauweise gegeben werden. Trotz der Ergänzungen wird der Turm eine Modelldarstellung in Originalgröße bleiben, da die Kenntnisse über das Aussehen nur minimal sind. In Zukunft wird er jedoch nicht nur als Umriss eines Gebäudes, sondern als ein vollständiges Modell einer möglicherweise auf diese Art gestalteten Turmanlage über dem Tor aufgeführt werden. Die grundlegende tragende Konstruktion wird aus alten, industriell gefertigten und imprägnierten Pfosten, die ehemals Elektroleitungen trugen, erbaut; diese Pfosten haben eine sehr gute Haltbarkeit im Boden. Die Errichtung des Gehäuses und des Bodens wird auf eine solche Weise durchgeführt, dass ein zukünftiges Auseinandernehmen und Ersetzen dieser Teile auch ohne den vollständigen Abbau der Anlage des Hauptturmes möglich ist. Bauteile, die dem Wetter ausgesetzt sind, werden mit chemischen Konservierungsmitteln behandelt. Die Pfosten werden im Boden mit Beton eingesetzt und an der Oberfläche mit Ringen aus Steinen umfasst, damit sich der Einbau der Pfosten von ihrem Aussehen her gut in das umgebende Pflaster aus Steinen einpasst. 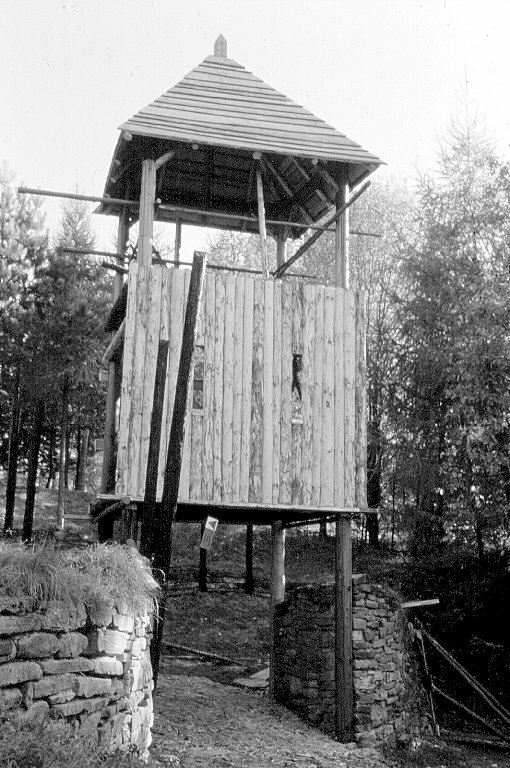 Die Anlage wird an jeder vertikalen und horizontalen Ebene mit Dreiecks- und Kreuzverbindungen stabilisiert. Die Verbindungen werden mit Nägeln abgesichert. La plupart des expérimentations récentes de reconstitutions se sont concentrées sur la recherche, ľorganisation et la réalisation. Or, presque chaque reconstitution peut remplir encore une grande fonction pédagogique et non seulement celle scientifique. Mais cela exige ďassurer un bon état de la construction. Aussi dès le début, il est nécessaire de penser au problème des travaux ďentretien. Le site archéologique sur la butte de Havránok (Liptovská Mara - I) compte pour ľun des plus importants en République slovaque. Entre 1986 et 1992, on y a réalisé le projet de la reconstitution progressive, modèle et expérimentale des éléments choisis du site. Ce projet a eu pour but de présenter ce site aux visiteurs à trois dimensions. En appliquant différentes méthodes, on a reconstitué une ferme avec un habitat et des bâtiments ďexploitations, une partie de fortification avec la porte ďentrée, la porte donnante sur la partie supérieure du lieu fortifié avec ľenceinte contigüe, un habitat enterré et un châtelet médieval sur le sommet de la butte. Comme on n’a pas disposé d’assez de données, la porte ďentrée n’est qu’une construction modèle hypothétique. Sa forme a été marqué par les lignes des poteaux porteurs et des poutres posées aux niveaux des étages. Au deuxième étage on a construit le plancher et un mur jusqu’à la hauteur de 1,5 m. Le toit à deux versants a été indiqué par les poutres aux coins. Au début on ne s’est pas assez occupé de ces constructions à Liptovská Mara qui commençaient à se délabrer. En 2003 ľétat de la tour a été critique ce qui nécessitait une reconstruction immédiate. Ľexpérience a prouvé la justesse de ľidée de départ à savoir celle que la présentation des structures choisies à trois dimensions fera valoir le site. Les expériences ont aussi mis en évidence qu’un entretien continu et soigneux de la construction solitaire en bois n’est pas réel pour plusieurs raisons (financières, organiques, techniques etc.). En effet, la construction doit être préservée tout ďabord par un mur et aussi par la manière de réalisation. La tour garde son caractère de modèle car on dispose toujours du minimum de données sur son aspect. Néanmoins elle ne sera plus présentée sous les contoures, mais comme modèle ďune tour hypothétique. Les éléments porteurs de fonds seront réalisés en poteaux imprégnés de télécommunication qui ont déjà prouvé une très bonne résistence sur le site. Les murs et le plancher seront construits de manière à pouvoir être remplacés sans démateler la construction. Les éléments exposés aux intempéries seront imprégnés. Les poteaux seront plantés dans du béton et garnis de cols en pierres au rez du sol pour qu’ils aillent bien avec le dallage. Toute la structure sera épaissie à chaque niveau vertical et celui horizontal avec des liens triangulaires et en croix. Les liens seront encore garantis avec des clous. ASHURST, J., and N. ASHURST, "Practical Building Conservation. Wood, Glass and Resins", English Heritage Technical Handbook, vol. Volume 5, Hants, Gower Technical Press, 1989. BEIER, J., and Z. TYN, Ochrana dřeva, Praha, Grada Publishing, 1996. KOHOUT, J.., A.. TOBEK, and P.. MULLER, Tesařstvi, Praha, Grada Publishing, 1996. MAKÝŠ, O., Rekonstrukcie stavieb – technologia, Bratislava, Jaga Group, 2000. PIETA, K., Liptovska Mara – včasnohistoricke centrum severneho Slovenska, Nitra, AU SAV, 1996. PIETA, K., Liptovská Mara. Ein fühgeschichtliches Zentrum der Nord-Slowakei, Bratislava, 1996. PIETA, K., "10 rokov archeologického múzea v pirodé v Litovskej Mare (with summary in German: 10 Jahre Existenz de archäologischen Freilchtmuseums in Liptovská Mara)", (Re)konstrukce a experiment v archeologii ((R)EA), vol. 3, Hradec Králové, SEA, pp. 125-134, 2002. TICHÝ, R., and R. THÉR, (Re)konstrukce a experiment v archeologii ((R)EA), vol. 3, Hradec Králové, SEA, pp. 198, 2002. 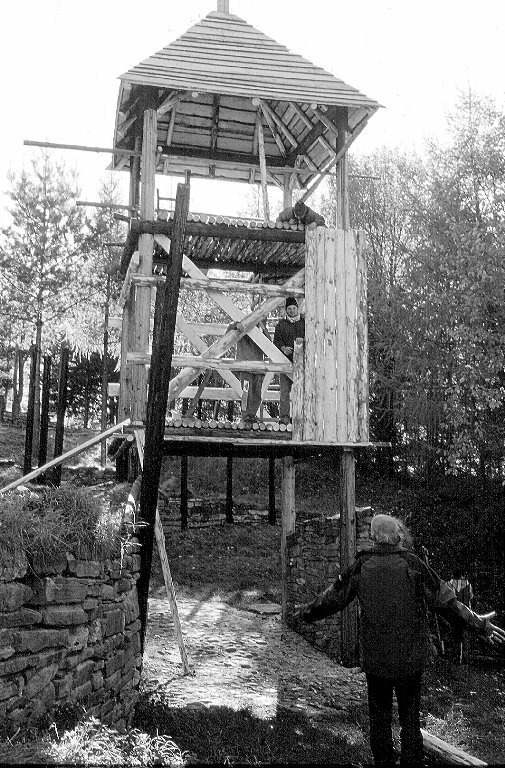 ŽAK, J., and L. REINPRECHT, Ochrana dřeva ve stavbě, Praha, ABF/Arch, 1998. Znalecký štandard: Stanovenie hodnoty strojov a strojových zariadení, Bratislava, Vysoká škola dopravy a spojov, 1993. Fig 1. Condition of the tower in 2000. Fig 7. Erecting a new post. Fig 9. Finishing of a roof frame.